Aside from baseball and football, one of the most loved sports of all Americans is the immortal game of basketball. Since its popularity as a world sport, many shoe manufacturers around the world saw this as an opportunity to open a new market for sports goods. The proliferation of different basketball shoes supported the sport further, and extended its popularity even to the common folks, usually those who just want to have a good time dribbling around in an outdoor court. Definitive comparison between different quality brands of basketball shoes is difficult though, but we have absolute confidence that Under Armour basketball shoes lie at the upper end of the spectrum. Reducing the weight of a sports shoe can be effectively done in many ways, and isalways done with the ultimate goal of improving the wearers speed. But can the shoes’ lightweight features be amplified when two or more of these are used simultaneously? That would be a natural yes, and Under Armour basketball shoes are a living testament to its efficiency. 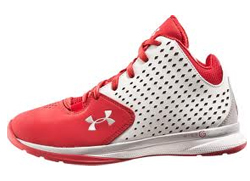 Most Under Armour basketball shoes have modified, properly-lined lightweight synthetic uppers, used in tandem with other regular features of Under Armour shoes such as Micro G. In addition to the lightweight construction, it is also feels lightweight to use, thanks to the shoes’ improved breathability and flexibility. Shoes wear out generally due to stress and gradual abrasion. The damage is most significant when the shoe suddenly alters its direction of movement, because not only does it scrape away part of the shoe, but it also produces forces that stressthe entire shoe. A sports shoe that frequently comes into contact with these forces would surely wear down a lot faster without proper support and adjustments in design. A pair of Under Armour basketball shoes deals with this situation by using two of its durability-building features: application of TPU (thermoplastic polyurethane) on the heels and shank, and the use of a full-length rubber outsole with a multi-directional traction pattern. But perhaps the best quality that defines all Under Armour basketball shoes is its advanced design that is always ultimately geared towards maximum comfort. Each and every pair of Under Armour basketballs shoes uses different features combined together to make sure that each section of your foot is properly fitted inside, from your toes, to the ankles, even up to your heels. This custom fit feel allows for greater impact resistance, which also adds to the protective quality of the shoes, indirectly keeping players at their peak performance. Weight reduction design techniques can be efficiently combined together to amplify the speed-boosting qualities of the shoes. Shoes used for intense physical activities like basketball needs multi-layered protection systems against abrasion and stressing forces. Comfort can equate to protection, if the level of comfort can significantly reduce the level of pain coming from the physical activity. For those who are interested to shop for Under Armour basketball shoes, remember that itsmost distinct detail is its stylish translucent outsole.